Health, Wellness, Massage in beautiful Campbell River BC. Choose one of these relaxing massages to melt away stress, tension, aches and pains and improve overall health. Prices listed are for one session. If you’d like to save money by purchasing a package of 4, please scroll to bottom on page. Indulge with this deeply relaxing oil massage with essential oil aromatherapy. This is an all over body massage that melts away stress, tension and fatigue and leaves you with a soothing sense of total peace and tranquility. Unwind and enjoy this full body massage to balance the body, mind and spirit. Enjoy a Deep Relaxation Massage for your health and well-being. A soothing Holistic massage is an ancient method of healing that not only relieves stress and muscle tension in the back, shoulders, neck, hips and legs, arms, hands and feet, but also helps with circulation and energy flow through all parts of the body including all our organ systems. It clears the lymphatic system for better drainage and releases toxins from the body. By recognizing that illness and stress affects not only our physical but also our emotional, spiritual and mental well-being, holistic massage allows the body’s natural healing abilities to balance the entire body, mind and spirit as a whole. Personalized to fit you, this deep tissue massage can be an overall body massage or we can work on specific areas/issues. Sooth away stiff and sore muscles, stress and tension using oil massage and deeper more therapeutic techniques for full relaxation and health benefits. 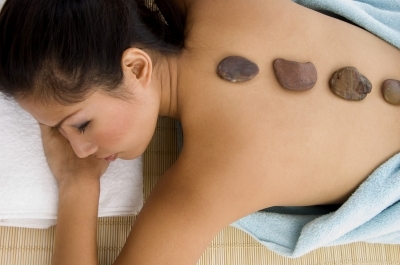 You’ve never had a Hot Stone Massage like this one! Large West Coast Stones are placed along either side of your spine and used to absorb the heat slowly into your back with medium to firm pressure. Warm oil is massaged all over your body followed by a wipe down with hot wet towels. Relax and enjoy! Shiatsu is a form of massage which originated in Japan and has recently become popular in North America. Despite what comes to mind for some who think of Shiatsu as a chair massage using fast karate chop hands to tap on your back, the real form of Shiatsu uses powerful, profound yet gentle palm movements and because the motions are slow and deep they are kept in rhythm with your breathing and so therefore it is a very relaxing massage. You’ll begin to feel your muscles succumb like melted butter as your Central Nervous System moves from Sympathetic to Parasympathetic mode in total relaxation. *All gift cards and packages are valid for one year from date of purchase. $80 for 1 hour, $105 for 1.5 hours, $50 for 1/2 hour. $115 for an individual 1 1/2 hour session or $90 for an hour session. All massages are non-sexual in nature. My services do not replace medical care or advice. Please see your medical physician when in doubt. To order or for more information, click on the blue contact button on the left, or call or text Sara at 250-203-1669 or email me sara@innerenergy.ca ! You can also use the online booking calendar to set your appointments. Anam Cara means “Soul” Friends! What a success for our valley wide health day!